Wow! You've got to check this out even if you don't teach anatomy, health, or human body systems. 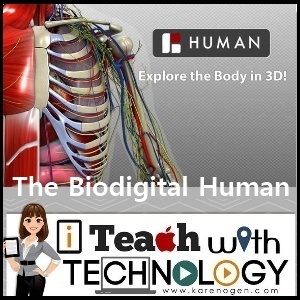 The FREE Biodigital Human Body is a 3-D model that you can manipulate, dissect, and choose layers, systems, and organs to learn about the body, parts, systems, functions, and diseases. It is available on the web, as an app for iPad and Android, and as a Google Chrome add-on. The images are amazing and the information is detailed enough that college students use it in their studies. As a disclaimer, you ARE viewing the human body, so be aware that ALL body systems are available (I work with elementary students, so I think about these things). There are so many ways to view the body and systems in this program that it could take awhile to learn how to use all the tools. I don't know why I haven't seen this amazing resource before! The build tools are straightforward and simple. The library comes with 6,000 images for your use, but you can also upload your own images and the software will also animate those as well. You can completely customize the text and choose from a good variety of fonts. The program also comes with a nice selection of background audio from which you can choose. The bottom line, yes it does cost for all this goodness, but there is a 14 day free trial to see if you like it AND an educator's discount! I think that my 4th and 5th graders could easily master this program and this is a fun and unique way for students to present information. Plus, if you give professional development workshops or present at conferences, you can wow your audience by giving them something new to see. Like I said...I love it when a tool makes me look talented! Brain Pop has a new selection of FREE games that you and your students can play even if you don't subscribe to their full content. These standards based games are great to display on your Smartboard for whole class or small group lessons or for students to use individually. They cover a variety of content for students K-12. 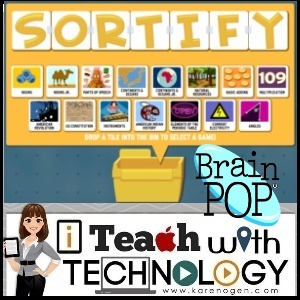 But, hands down, my favorite is the new game called Sortify! What I love about the Sortify game is that the Brain Pop developers have provided the content, but YOU create the game! As you see from the images, there is content for math, language, chemistry, music, etc, but the bins at the bottom are empty. When you start the game, you choose from a menu of items to choose how you would like to sort the items. Some are easier than others. This games allows you to differentiate for your learners! This also means that the game is never repetitive because there are so many different ways to play. Although I highly recommend Sortify, there are many other great games offered on Brain Pop's site, too. 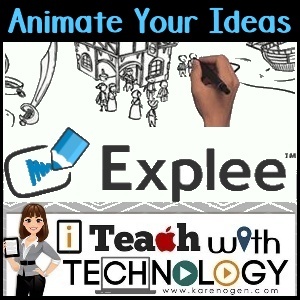 Have fun exploring some amazing new, interactive content for your students! 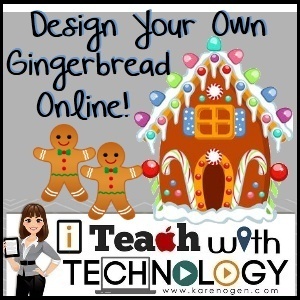 Design Your Own Gingerbread House or Cookies Online! I love decorating cookies and cakes, but I hate the mess! If the kids are begging you for some more holiday fun, now you can let them create virtually with this delicious selection of Gingerbread themed games. Not only can you decorate to your heart's content (because unlike real decorating, you can just start over when you mess up), I have also snuck in some gingerbread themed math games and stories. The only thing missing is that ginger and sugary smell! Are your students a little Christmas crazy leading up to the holiday break? 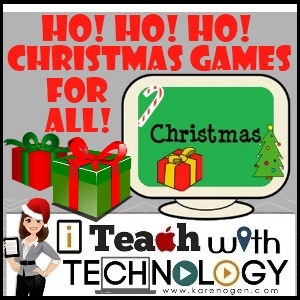 Keep them busy and learning with this collection of (mostly) educational Christmas games. You will find a sleigh full of Santa approved games that support learning for math, language, and logic. There is something here for every student from Kindergarten through 5th grade. 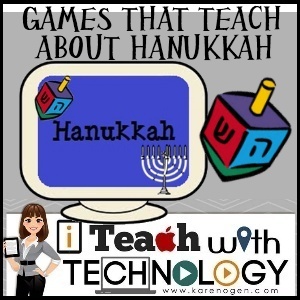 If you have a student that doesn't celebrate Christmas, there are also Winter Themed games plus Hanukkah, Kwanzaa, and Holidays Around the World Themes, too! 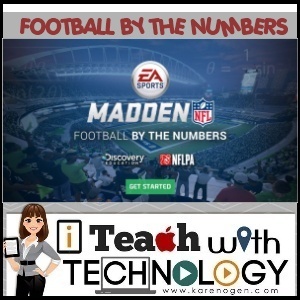 Madden NFL: Football By the Numbers is a WIN for Math and Science! EA Sports, Madden NFL, the NFL Players Association, and Discovery Education have just released an online interactive called Madden NFL: Football by the Numbers. This engaging program created for middle school students is designed to translate students’ love for football into a deeper understanding of the math and science behind America’s greatest game. Students will be engaged while they PLAY the Digital Interactive and tackle the game-time decisions necessary to ensure success for their team. They won't even realize how much they will LEARN about the math and science behind the offensive and defensive tactics utilized by the National Football League’s coaches and players. There is a Teachers Guide created for you, too! Visit this page to learn more about the interactive program and resources available. I love polar bears! I've even been to Churchill, Canada (which is known as the polar bear capital of the world) to see polar bears in their yearly migration to the sea ice. 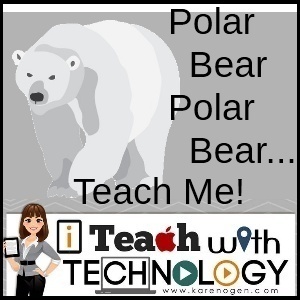 So, today I bring you three amazing resources for your students to use to when learning about polar bears, arctic animals, biomes or ecosystems, real-world math, geography, or literacy. Your students will be amazed with these two sites that allow you to track polar bears through their satellite collars. You can follow individual bears over time as they travel on land and then over ice as it forms in the winter months. Connect math by estimating how miles per day your polar bear has traveled. Connect with literacy and science by writing a journal for your polar bear. The WWF Species Tracker follows polar bears in Norway. The Polar Bears International BearTracker follows polar bears in Canada. Hey, if you can't visit polar bears in the wild or in the zoo you can still bring them into your classroom through Explore.org and the Tundra Buggy Webcam. This seasonal live camera that is connected to a buggy drives around the tundra all day and films polar bears for your enjoyment! No worries if you are out of season as they replay highlights from the live season all year long. How about graphing certain behaviors such as walking, digging, or rolling? Can your students make inferences from the polar bears' behavior or from something they see and then play Myth-busters and do some research to prove or disprove their theory? Say "hi" to the polar bears for me! 1. The ability to compare the average diet of several countries and you can even narrow down further to compare one particular food category such as sugar and fat. Math connections, anyone? Tons of percentages and numbers to compare here! 2. You can learn more about the eating habits of people in other counties and how they have changed over the years. This is a great way to discuss the social, political, and environmental changes that have taken place over time and how they have affected people's eating habits and food availability. 3. You can also view the consumption of various meats by different countries. This is a great way to discuss how location and availability of resources drive the choices we make. 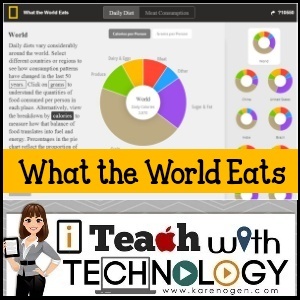 I hope you find a way to use What the World Eats with your students! Do You Wanna...Play Some Fun Winter Themed Games? 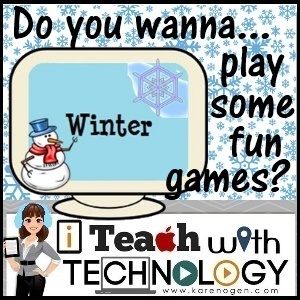 Winter is here and although we don't have any real snow in the south, there are plenty of virtual ways to play! You will find heaps of icy fun with this collection of games that are centered around the winter themes of snowmen, snowflakes, and snow! All of your students from Pre-K to 5th Grade will find something fun to do. 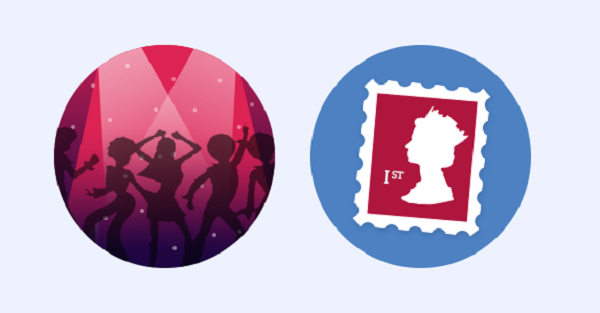 Teachers, don't forget that you can also easily connect many of these activities to curricular content. Check out the Snowflake Factory and Snow Storm. They both have connections to fractions and percentages. Math connections to make with snowflakes: symmetry, patterns, angles, shapes. Study the science of snow and snowflakes. Compare your virtual snowflake design to a real snowflake design. Create a Venn diagram to compare the two. Choose a simple snowman creator and figure out how many different possibilities there are to create a unique snowman. Create a digital snowman glyph to represent the student. Graph the information used from the students' snowmen creations. Ex: What types of hats. Copy the digital snowman to a writing program and write a personal narrative, creative story, informational (how to), or practice using adjectives. Practice your fact families with Snowball Fight! 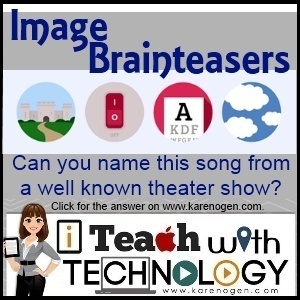 Are you into theater and brainteasers? (Hey, even if you're not, keep reading! *) Here is a fun resource for you that has been created by some talented artists at www.twentysixdigital.com and www.superbreak.com. They have put together a collection of 6 brainteaser images that you can find below. The illustrations are Catchphrase-style puzzles depicting famous songs from well-known theater shows, designed to challenge your musical/pop culture knowledge. The puzzles are brainteasers of sorts, and get children (and even adults) breaking down images and words and piecing them back together to figure out the answer. The challenge is to piece together the words depicted by the image in each circle to create a full song title. Did you figure out ‘Castle on a Cloud’ from Les Miserablés in the image above? Here are the 6 images. You are free to use them with your class. If copied, please give attribution to the talented artists at www.twentysixdigital.com and www.superbreak.com. *OK, for those of you that might not be into theater, what themes would you like to see and how would you use these in the classroom? The developers would like to know. Leave a message in the comments below. 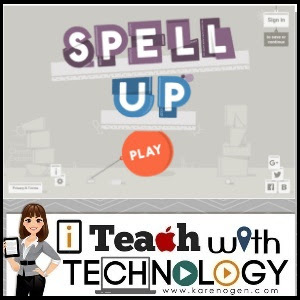 Spell Up with Google is a web-based game in which you build word towers by spelling words correctly. The better you are at spelling, the higher your tower goes! There are also word jumbles and missing letter words along the way. You also collect power-ups that can be used to bypass difficult words if needed. You must have audio to play as the words are spoken and can be sometimes difficult to understand. The game has a few tools to help you to understand the word including a translator, an alphabet tool, and a dictionary. Once you pass Level 1, the player can choose from beginner to advanced level words. The screen shot above shows words from the intermediate level. Your answers can be typed in or spoken. 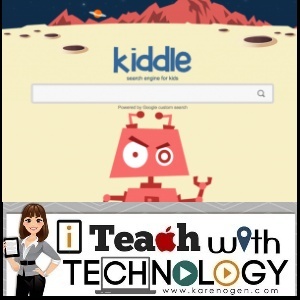 Spell Up with Google has a "for teachers" section that advocates using this site in the classroom for teaching spelling and word pronunciation. However, the teacher cannot set a level or provide words for this game. I also found a lag with the keyboard when using my iPad to play this game- even though I chose the correct letters, it did not register all of my keystrokes. Overall, Spell Up with Google can be a fun way to practice spelling maybe as morning work or when students have completed an assignment. Gobble Up Some Great Games for Thanksgiving Fun! Is turkey on your brain? Serve up some fun with this collection of (mostly) educational Thanksgiving games. You will find an abundant selection of gobbling good games that support learning for math, language, and logic. There is something here for every student from Kindergarten through 5th grade. 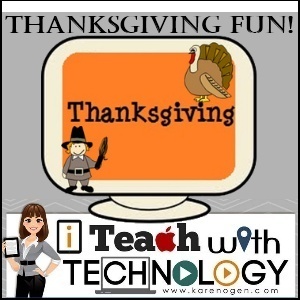 If you have a student that doesn't celebrate Thanksgiving, there are also Fall/Autumn themed games available. I enjoy reading because it is free of the extraneous noise and images. With a good book, my imagination is free to envision the setting, sounds, and characters. 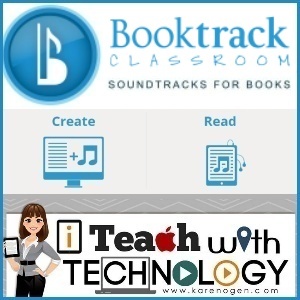 So, it may seem odd that I am writing about Booktrack Classroom, a site and app that incorporates music and sound into e-books to "enhance" the reading experience. Although I can't envision reading a book that includes a soundtrack, I can see valuable use of this site in teaching the writing process and writing for an audience. 1. Learning about imagery as a literary element. 2. Learning how the mood and tone of writing can bring an emotional perspective to the writing. 3. What is an onomatopoeia? 4. How do descriptive words help us to better understand the setting or a character. Booktrack Classroom is easy to use. Simply choose a book, type, or paste your text. Then select sentences, paragraphs or sections of the text and search for music, ambient sound, or sound effects to go with each section chosen. You can also upload you own sounds. Then publish to read in your online or app reader on your device. Thanks to my friend Steve Dembo for introducing me to Booktrack Classroom on a recent webcast, Survey Says, Mash It Up! through Discovery Education.